How do I view Supplemental Modules in the Gradebook? You can configure the Gradebook in many ways. 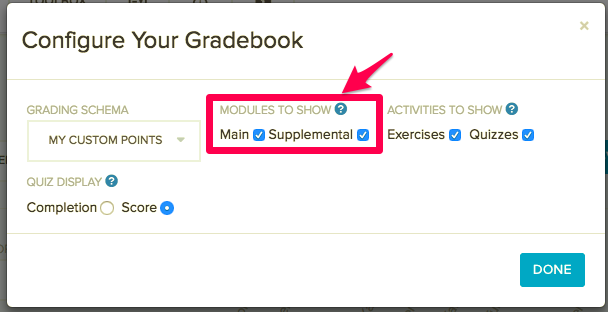 One way that you can configure the Gradebook is by choosing whether or not you see supplemental modules. To start, click the "Configure" button at the top right of the Gradebook. This will open up a menu with Gradebook configuration options. Under Modules to show, you will be able check whether you want to see Main modules, Supplemental Modules, or both. These settings will affect the modules shown in the dropdown and the activities shown in the Gradebook. 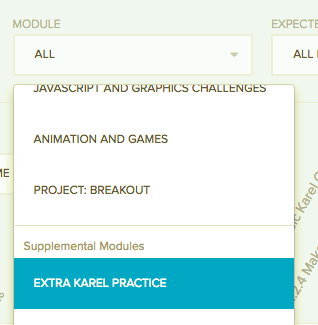 The module dropdown now has sections indicating whether the modules are Main or Supplemental. If you choose not to show one type of module that section will be hidden from the module dropdown. Here is an example where both Main and Supplemental modules are shown. Supplemental modules will always be listed after the Main modules.